New Brunswick is a natural choice for your vacation. With its scenic beauty, magnificent cities and towns, rich heritage and culture, there's a lot to do, see and explore. 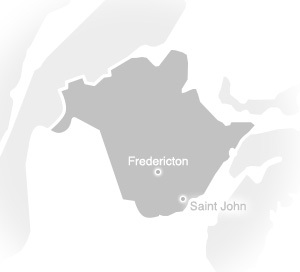 The Canada Select New Brunswick Web Site will help direct you to the most appropriate accommodations to suit your needs. Whether you are seeking a Hotel, a Motel, an Inn, a Cottage, a Bed and Breakfast, a Resort, a Hunting or a Fishing Lodge, our stars light the way to your selection. An Accommodations Rating Program is defined as "the rating of like accommodations based on the basics of cleanliness, comfort and safety, as well as the extent and quality of facilities and amenities." Canada Select inspects and rates all participating properties to ensure they meet consumer expectations. Ratings are based on extent and quality of facilities, services and amenities. The higher the star rating, the more extensive are the facilities, guest services and amenities. We have five scenic drives that all deliver ‘aha’ moments. Set your course for breathtaking and catch your breath. Head towards laughter and stop to listen to the music. Hear our stories, share the feasts from our kitchens, and make your own memories. Relax, refresh, renew. No matter what direction you choose in New Brunswick something special will be revealed.